1. 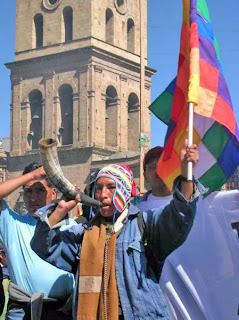 We reject and condemn the attempt to impose the so-called “Copenhagen Understanding” for not being an official outcome of the COP 15, for threatening and violating the rights of Mother Earth, for not respecting the rights and voices of developing countries of indigenous peoples and nations, intercultural communities, social organizations of Bolivia and the world. 2. We demand the review and amendment of the Kyoto Protocol to include the Universal Declaration on the Rights of Indigenous Peoples and the effective participation and ownership of indigenous peoples and nations, intercultural communities, social organizations of Bolivia and the World. 3. We recognize the Kyoto Protocol as the legally binding instrument in the international community, which has been signed and ratified, as a rule accepted by the countries. Therefore we demand its immediate compliance to all developed countries in the reduction of their greenhouse gases to counteract climate change and save our Mother Earth. 4. We therefore call developed countries to reduce GHG in 50% for the Kyoto Protocol’s second commitment period, which must start in 2013. In this century the increase of the maximum temperature, reached by Mother Earth must be below 1ºC, concentrated with a ceiling limit of 300 parts per million. 5. We propose the establishment of a Global Defense Council of Mother Earth at the head of the least polluting countries and especially indigenous peoples and nations, intercultural communities, social organizations, as a control mechanism in order to verify the effective and real compliance of reduction commitments of Annex l countries. 6. As peoples of the World we reject flexibility mechanisms and others that distort the real and effective greenhouse gases reductions from developed countries and we demand transparent and pure information regarding their domestic reductions.